Dyson V8 Vs. V10 Absolute Cordless Stick Vacuums (Differences): Dyson makes what we believe to be the best quality and performing cordless vacuums available. The Dyson V8 and V10 are outstanding cordless cleaning machines. The Absolute models come with extra accessories that allow you to clean your entire home and car. The key differences of the V8 and V10 lies with its bin size, configuration, suction, Floor tool, and battery life. 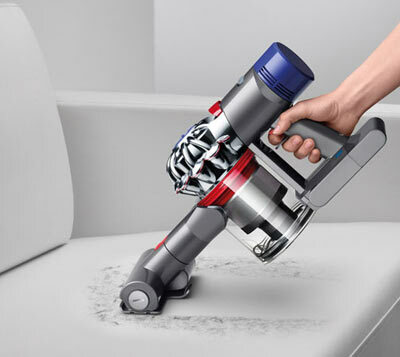 Bottom Line Dyson V8 Vs. V10: The V10 has many improvements such as 40% larger dust bin, increased suction using the new inline configuration, new Floor tool allows you to adjust suction, longer battery life. The V10 is a little bulkier in handheld mode than the V8 due to the larger bin. The V10 has new clog and filter indicator lights. The V8 is a fantastic cordless vacuum, the V10 is an improvement on the V8, but either cordless vacuum will do a great job of cleaning your home. Battery Life V8 : Battery life is 40 minutes (suction only), and 25 minutes with a floor tool. In Max mode (115 airwatts) you will get 6-7 minutes of runtime. The max mode is only needed for heavily soiled carpet. Battery Life V10 : Battery life has increased from 40 minutes (V8) to 60 minutes in the suction mode. There are now 3 suction modes: These modes are Low (16 airwatts with 60 minutes suction or 30 minutes with motorized tool), Medium (32 airwatts with 30 minutes of suction or 20 minutes with a motorized tool), and High (150 airwatts with 6 minutes of runtime). What makes Dyson Cordless Vacs Unique- Main Differences: Dyson has re-invented the cordless vacuum and has been an innovator and pathfinder in creating new technology. Dyson is known for strong, powerful, suction using new digital V7, V8 and V10 motors. One area that Dyson stands out is its tools. 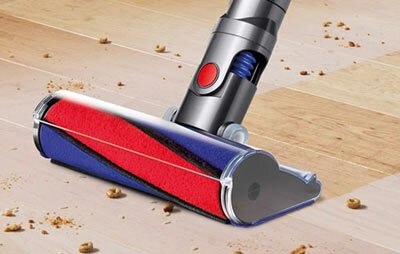 Dyson uses Nylon and Carbon Fibers on its main floor tool, to vacuum both carpets and hard floors. Recently Dyson introduced its new Fluffy hard floor tool, capable of vacuuming both large and tiny particles at the same time (Cheerios and flour). 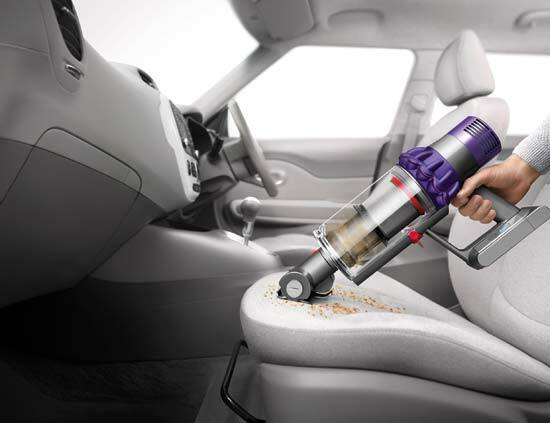 Dyson uses high impact polycarbonate plastics (same as used in crash helmets and riot shields) for greater durability.